Born in Zurich, Switzerland in May 1968, Hans Ulrich Obrist became Co-director of Exhibitions and Programmes and Director of International Projects at the Serpentine Gallery in April 2006, joining Julia Peyton-Jones, the Serpentine Gallery Director. Prior to this he was Curator of the Musée d’Art moderne de la Ville de Paris from 2000. 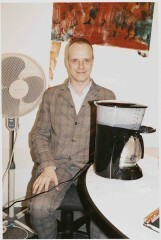 Since 1991, Obrist has curated and co-curated over 200 solo and group exhibitions and biennales internationally, including World Soup, 1991; do it, 1994; Take Me, I’m Yours, 1995; Live/Life, 1996; Manifesta 1, 1996; Cities on the Move, 1997; 1st Berlin Biennale, 1998; Laboratorium, 1999; Utopia Station, 2003; Dakar Biennale, 2004; 1st & 2nd Moscow Biennale, 2005 and 2007; Il Tempo Del Postino (2007) and Everstill at the Lorca House in Granada in 2008. Obrist conceived the Marathon series of public events in Stuttgart in 2005. The first in the Serpentine series, the Interview Marathon in 2006, involved interviews with leading figures in contemporary culture conducted by Obrist and architect Rem Koolhaas over 24 hours. This was followed by the Experiment Marathon, conceived by Obrist and artist Olafur Eliasson in 2007, which included 50 experiments by speakers across both arts and science, the Manifesto Marathon in 2008 and the Poetry Marathon in 2009. His recent publications include A Brief History of Curating (2008) and Cedric Price, Conversations, (2010).